Raffaele Ilardo, the Atelier Director and Creative Advisor at the house of Oscar de la Renta, takes us behind the scenes of "The Sample Room," in New York City. According to de la Renta, "It's a tremendous luxury to have a sample room, right next to the studio. Ilardo, who grew up in Italy, moved to Paris to start his fashion couture career--having worked first with Karl Lagerfeld at the house of Chanel for about 10 years, and then with John Galliano at Christian Dior for another 10 years. He finally recently joined the de la Renta team in New York, after 20 years of the Parisian lifestyle. Ilardo describes working for the Dominican born designer as an honor--referring to him as something like one of the last Fashion Mohicans standing: "Oscar is one of the last big [couture] designers left, and he really knows fashion." Ilardo alludes to de la Renta's equally impressive resume, having done major apprenticeships in Paris himself, prior to starting his own line under his name. The fashion icon has previously worked for luxury houses such as Balenciaga, Balmain, as well as Lanvin. Being highly educated about how to build a successful couture brand, he admittedly says, "It's a tremendous luxury in a city like New York to have a sample room next to the studio." 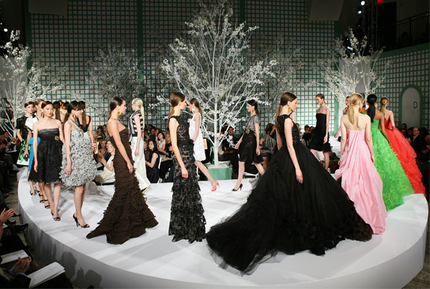 For de la Renta being able to go back and forth seamlessly between the design studio and the sample room is a virtue. Have a watch at this very informative behind the scenes clip of what goes into running one of the most popular designer labels in the world. A version of this piece appeared on dscriber.com.